Everybody is influenced by the work of others, I have lost count of the number of wonderful artists I have been inspired by. My love of the made image is pretty eclectic, I find admirable things in almost any genre. To me they represent different ways of seeing each as valid as the other. It is current to look down on the very detailed and for sure there is a very naive form of detail that is pretty dull… photorealism springs to mind. If I was to abhor detail I would have to dislike Pieter Breugel and many other artists I admire. True I myself am moving more and more towards suggesting detail rather than defining it, but about the relative value of each approach I am agnostic. I think in simple terms if something is “well” done in my terms I tend to like it, if I think it is unwittingly careless or clumsy then I tend not to. A good way of assessing value of worth in works of art is sorely needed. Time was that fashion dictated it in the short term and continual historical reassessment in the longer, but both of these are somewhat lacking. With our current fragmentation of style due to every image from the year dot being available as an influence, there is no one defining fashion that can be drawn on. Historical assessment is weakened by its need to identify changes or the arrival of new things and allow time to see if they have any lasting influence on later artists. As it is the artists who get ascribed as the movers and shakers are promoted into a sort of stardom that doesn’t have a simple relationship with their work. Indeed in the case of an artist such as Picasso where all his works are lifted to the heights what ever their quality, I think it would be fairer to say he produced many brilliant, much capable and vast amounts of workaday art rather than lifting his entire oeuvre to the stratosphere. I was struck recently by the furore about the “new” Leonardo of Christ. There was much eulogising of “the hand of the master” type, but nobody seemed to notice it was a terrible painting! If it was by Leonardo, which I very much doubt, he was having a particularly bad day. If you look at any so called “master” the work is far from all masterful, it is as you might expect a mix of high points and lower ones. Maybe we need to forget about the artist and his historical context and just concentrate on the actual physical works. Even some cave paintings look better than others to my eye, and I would bet that there was a pecking order amongst cave painters as there is amongst current artists. I realise no definitive ranking of worth can be achieved but that shouldn’t prevent some sort of judgement being made. Much art produced today is shockingly poor and ranked not by the quality of the work but by the fame and status of the artist. That’s today’s rant over, I’ve not the energy for more! Paintings can be clicked for larger views. A view nor very far from the wonderfully named Stratford Tony which is in turn near Salisbury. I was attracted by the abstract simplicity, though maybe the final result is a little dull. 11in by 9in Arches CP. 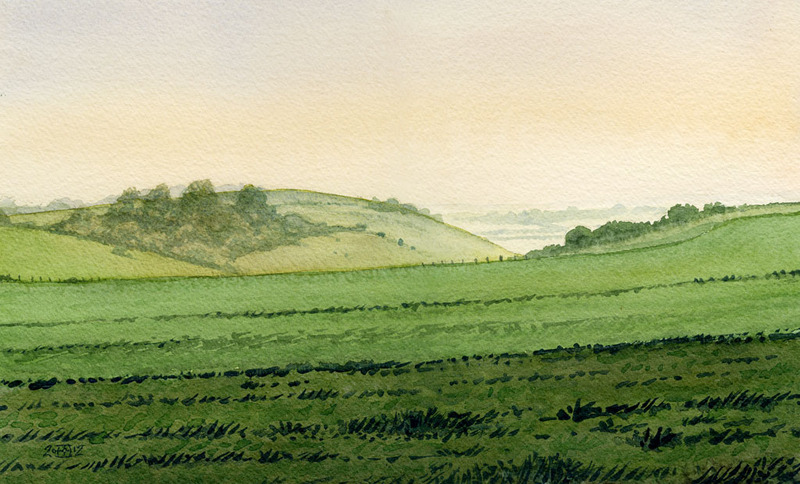 There were so many lovely sights on my visit to Dorset I am rather spoilt for choice in subjects for studio paintings. 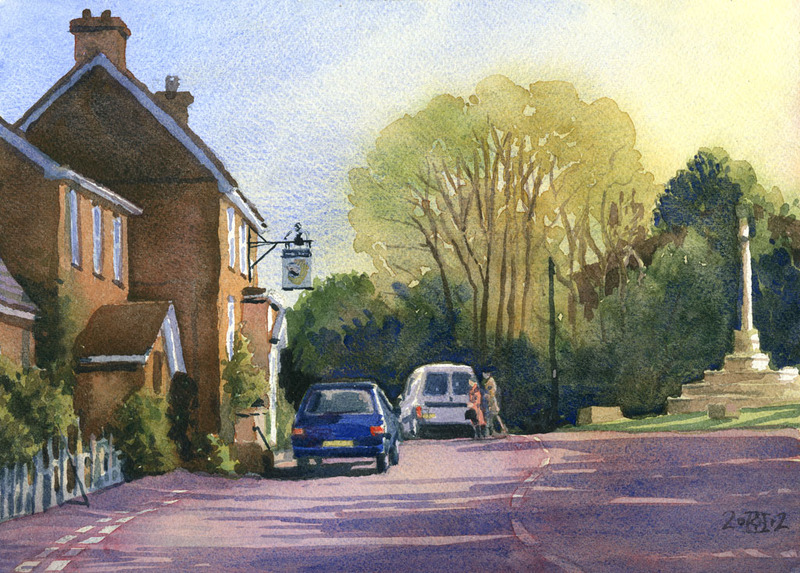 This is Childe Okeford, the morning light was just natural watercolour material, I had to be very careful to keep it all fresh. 11in by 9in Arches HP. Here is one that would have been impossible plein air, though I did make careful note of how I felt the colours were as I know that any photographs will be disappointing when viewed later. 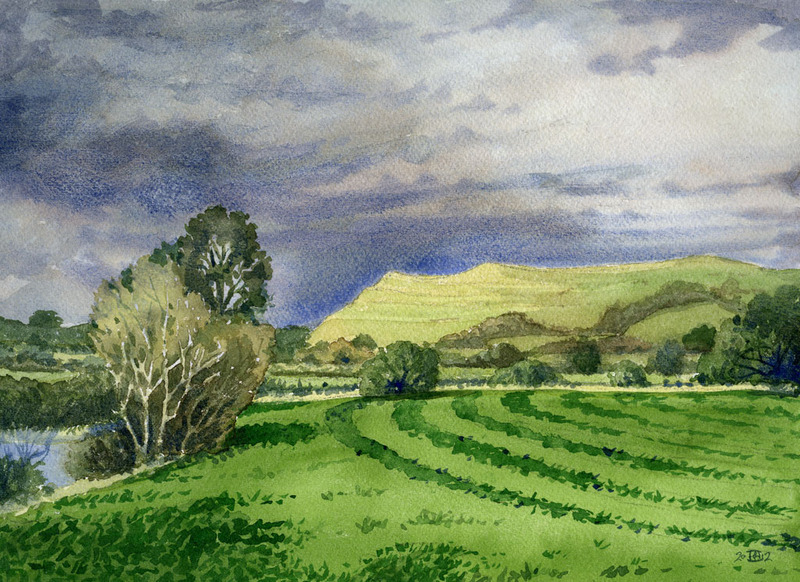 I actually had a choice here as moments later Hambledon Hill, seen here brightly lit, was a black shape against the sky! I may indeed do one with that arrangement to see which works best. The mown field in the foreground was a gift composition wise. 11in by 9in. This is a disused canal near Britford close to Salisbury… dull and wet but very English! 11in by 9in Arches CP. 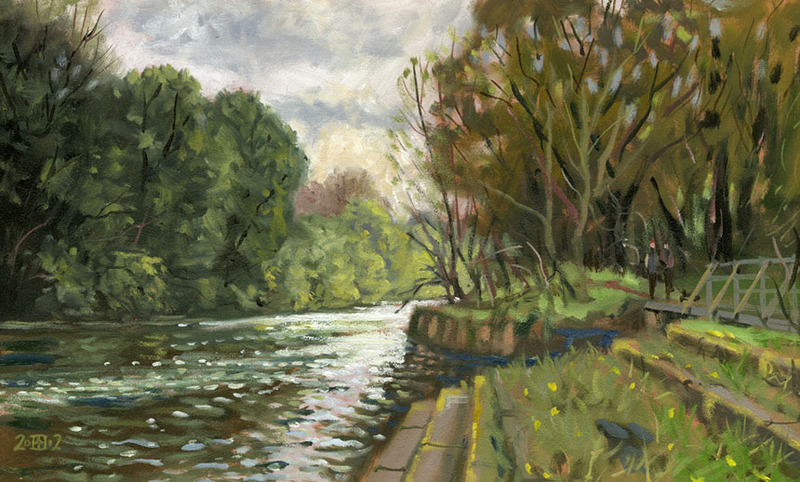 When I did first saw this scene I though it would make a good watercolour, but due to the weather I had to paint it in oils. So here is the watercolour version. The oil can be seen here. 1/4 sheet Arches Rough. 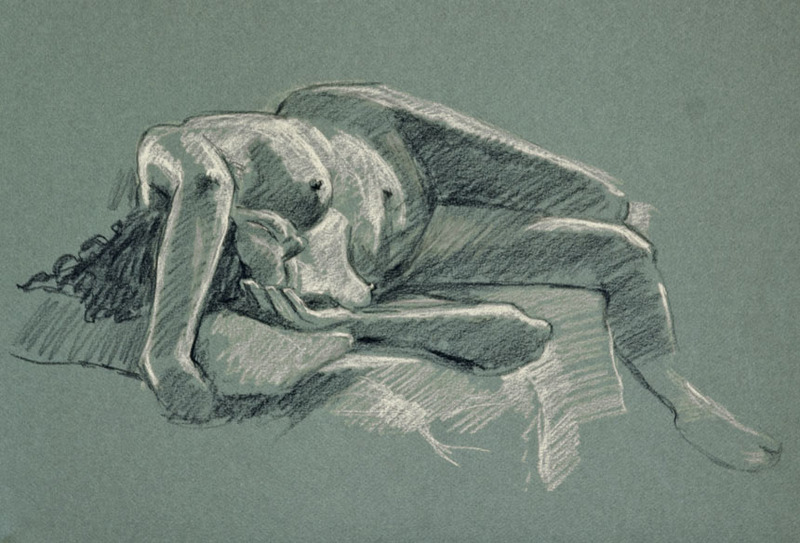 Now a few life drawings to finish off. That’s it, good to have life drawing back on the go! I’ve done quite a bit of travelling in the last week or so. 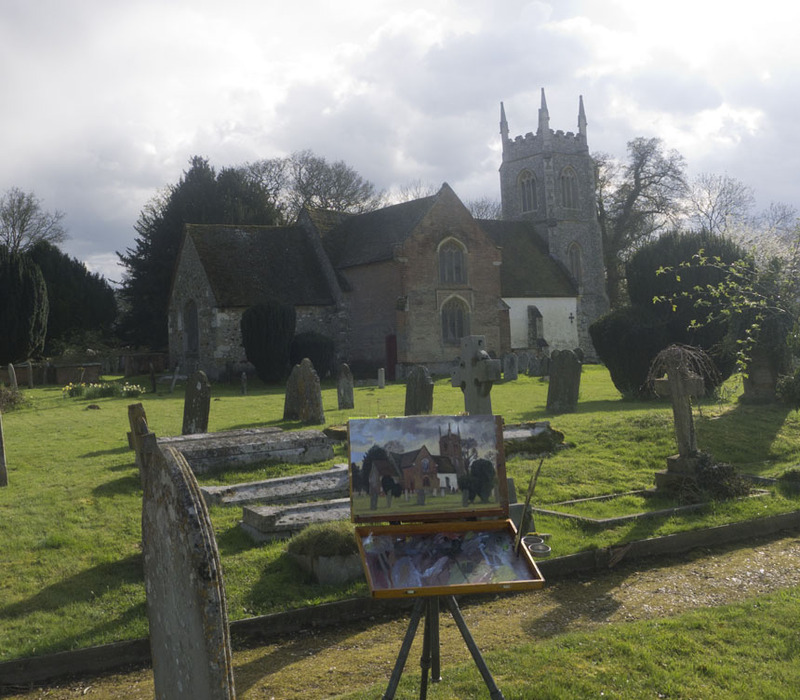 Friends invited me down to Dorset for Easter and then I was due to paint with fellow artists on the western reaches of the Thames. I have been pondering the ins and outs of choosing what to paint and spotting a winning composition. In some ways it is easier choosing winners from photographs after than en plein air on the day. When faced with the real world spread before you in full 360 degree three dee it is easy to be overwhelmed. The camera takes handy snippets and cuts the problem down to size. 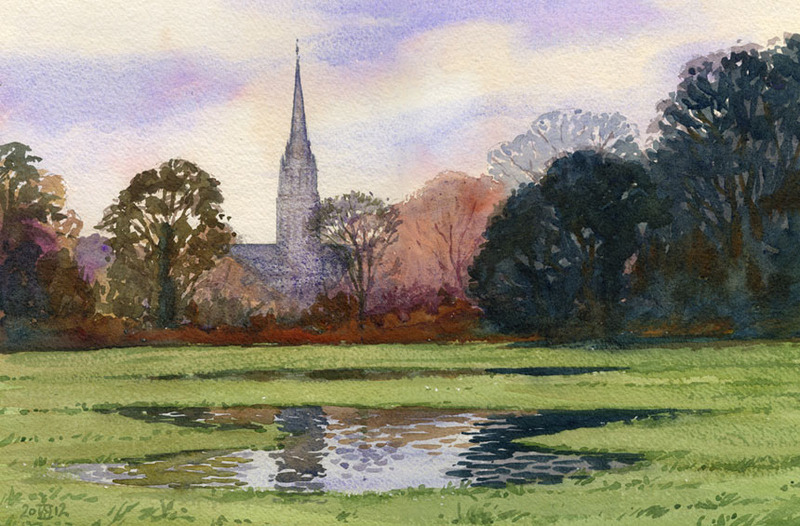 There is of course no problem when the subject is plain as a pikestaff, one of the paintings below of Salisbury is a case in point. 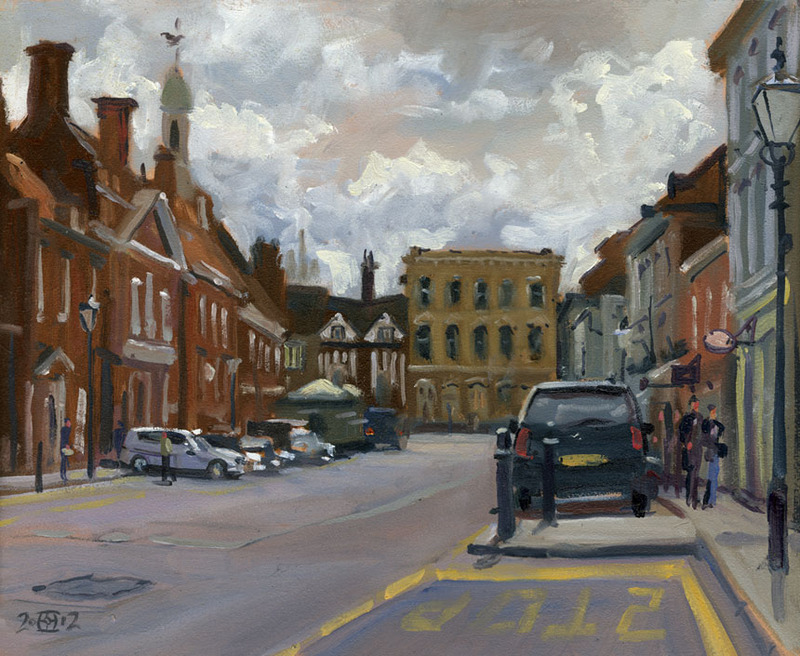 Generally the less complex the stuff before you is the easier the task, which might explain why Norfolk is a popular painter’s destination. The simple division of land and sky punctuated by the odd tree and aesthetically placed windmill is a winning combination. Other straightforward recipes are something light surrounded by dark or the same inverted. It is easy to set yourself rules that will deliver reasonably pleasing results. However experience has taught me that whenever you make up a rule for painting something will crop up as an exception. Compositions are no exception, every now and again something works that just shouldn’t. One thing I always find frustrating is that many very beautiful scenes, especially those wide vistas that have handy parking spots for folks to stop and gawp, just don’t often make good paintings. Usually because there is no place for the eye to rest so it wanders lost and rudderless here and there. Why exactly that should be unsatisfactory in a painting or photograph, but more than acceptable as real view is I fear beyond me. On the other hand some unremarked corner will once painted gain a elegiac quality that speaks to the viewer. We are also more prone to admire the scenery when it is lovely and sunny, especially in the evening light when everything is bathed in honey gold light. Yet I have got some of my favourite paintings from days when any sane person would hunch their shoulders and head for a warm cosy fireplace. I just have to admit it, I have no idea what prompts me to paint a particular scene. I suspect the reason is different for every one. Here is the top view closed, I used simple snap catches, I might replace these but they are fine for now, I had to search around for a brass carrying handle but RS had them (rswww.com) it is rounded so comfortable to carry. T’other side. The hinges are high torque, adjustable with an allen key also from RS. My eureka moment was to put the camera mount on the hinge side which makes for a much more balanced affair with less stress on the tripod. I just carve the camera mount out of hardwood. 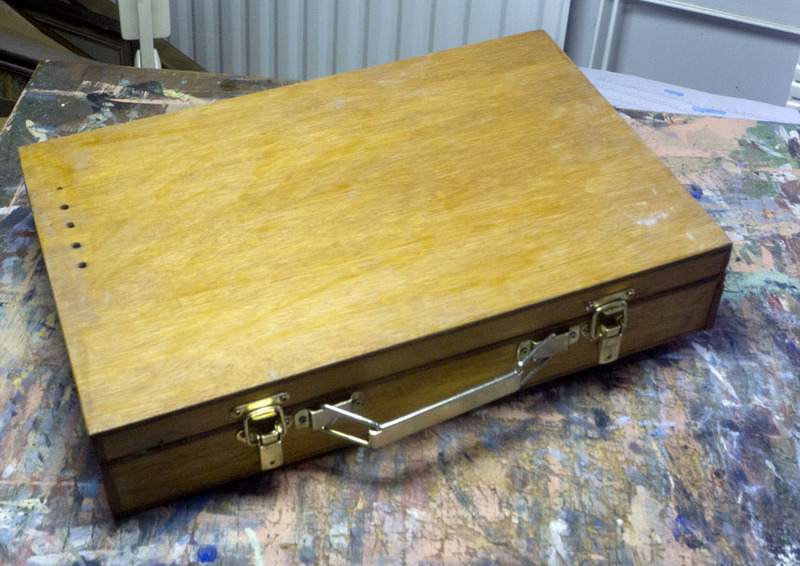 Here is the wet board store, it can take four 16in by 10in wet panels or more smaller ones. I just used standard aluminium channel which as, luck would have it, is exactly right for 3mm MDF panels back to back. Here it is opened. Now you see the reason for the holes, the hole in the side allows the dippers to be screwed on. The sliding bolt allows any varied widths and orientations of panel to be accommodated. 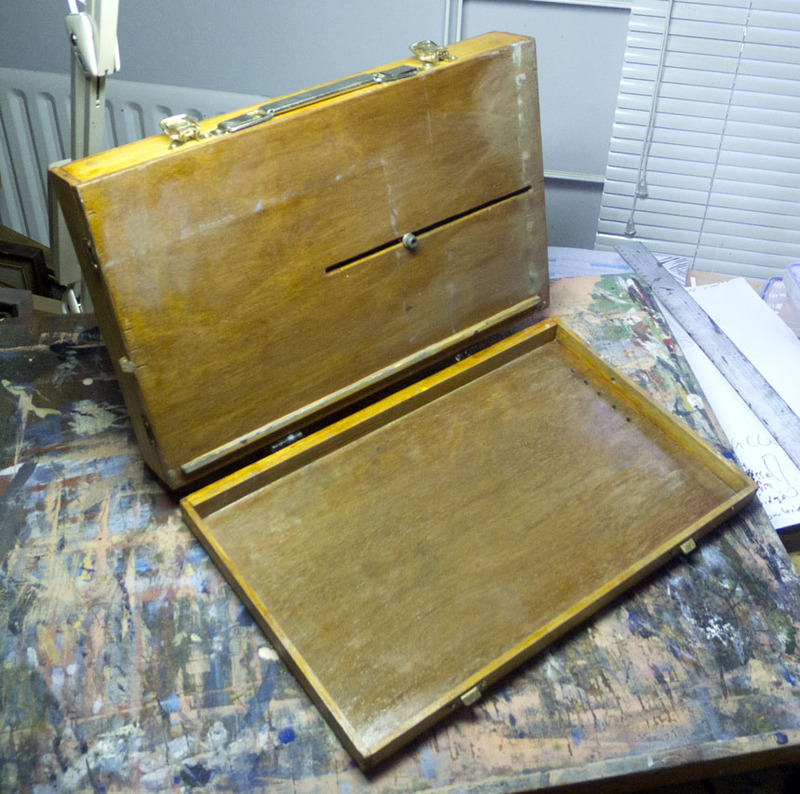 The palette surface is smoothed with a cabinet scraper then linseed oiled, with use it will get smoother. One advantage is that I can leave the wet paint in situ between subjects which saves paint. The whole thing weighs less than a kilo. 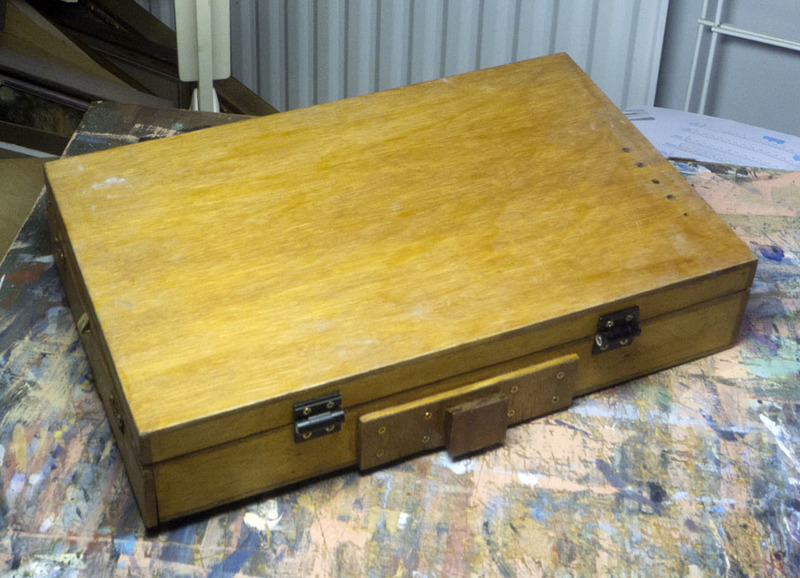 I have to add a further picture of it in use… pochade enthusiasts may have to lie down in a darkened room for a while before moving on to the paintings. Here it is being used in anger, or at least mild irritation as the light keeps changing. Note the dippers deployed on the righthand side. 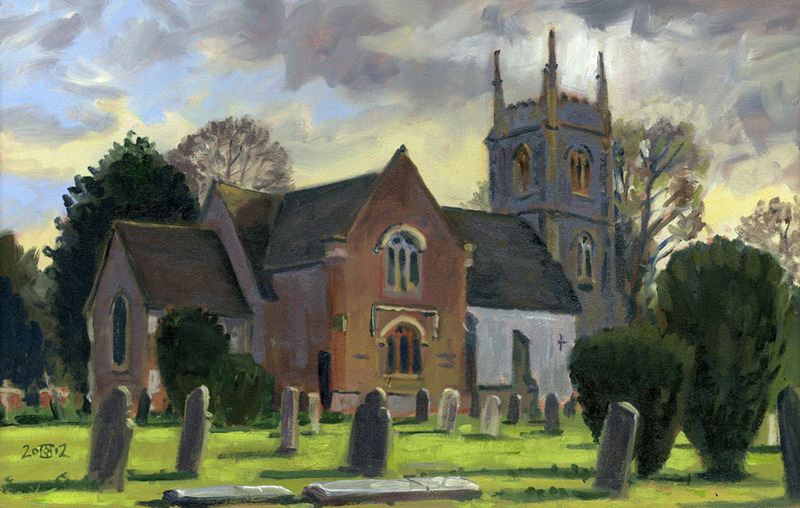 This is The church of St Marys at Hartley Wintney. Out of order but it links with the pochade in action picture. 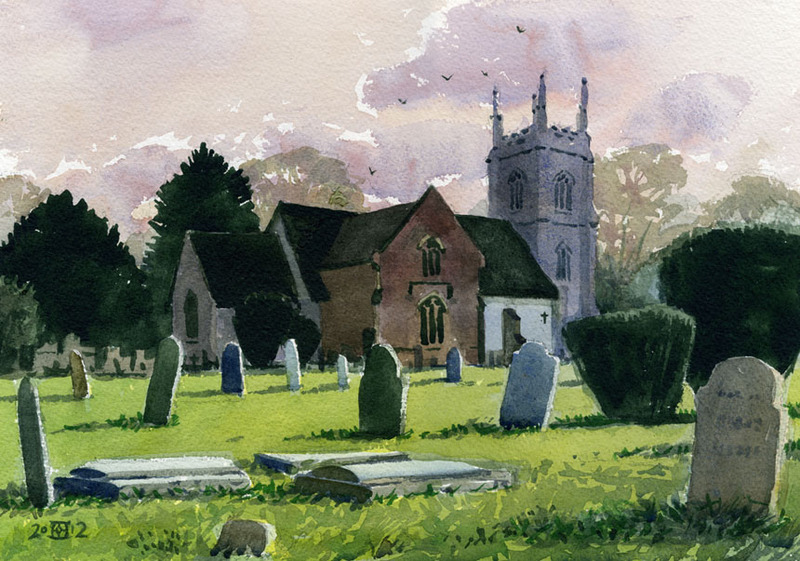 Very difficult light and I had difficulty deciding on the tones for the church. The building is as you can see a hodge podge of styles and materials. I started off with the white wall far too bright and had to tone it down. At the last minute before it rained on us the sun came out and lit up the foreground which really made the scene come alive. 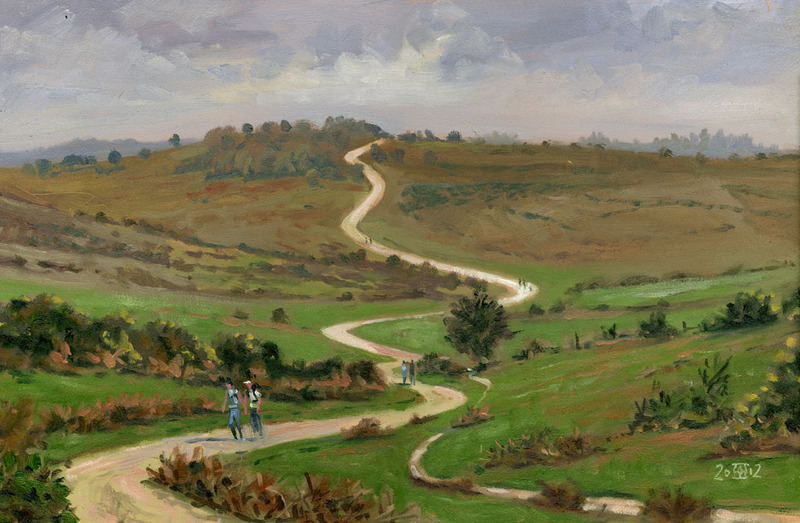 Meanwhile four days earlier… On my way down to Dorset I was tempted to park and get out my paints by a glimmer of light as I drove through a bit of heathland in the New Forest. The light promptly disappeared as soon as I was set up. I was left with trying to make something of the very subtle tones that faded to the distance. I had the vague hope that the path would hold the whole thing together. It almost works but one for the cupboard rather than the framer I feel. 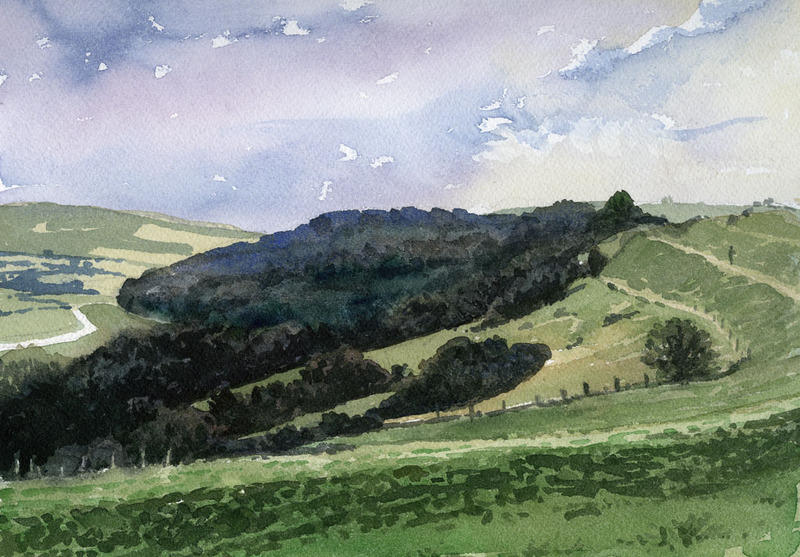 This is Hambledon Hill in Dorset. It is an iron age fort with concentric ditches running round the hill. Very dramatic but hard to paint especially in such neutral light. But I am really pleased with the result. It, as I mentioned above, breaks all sorts of rules of composition but somehow works anyway. It is on Arches CP which I think I must use more as it gives a feel to the washes that is suitable to this sort of structured scene. 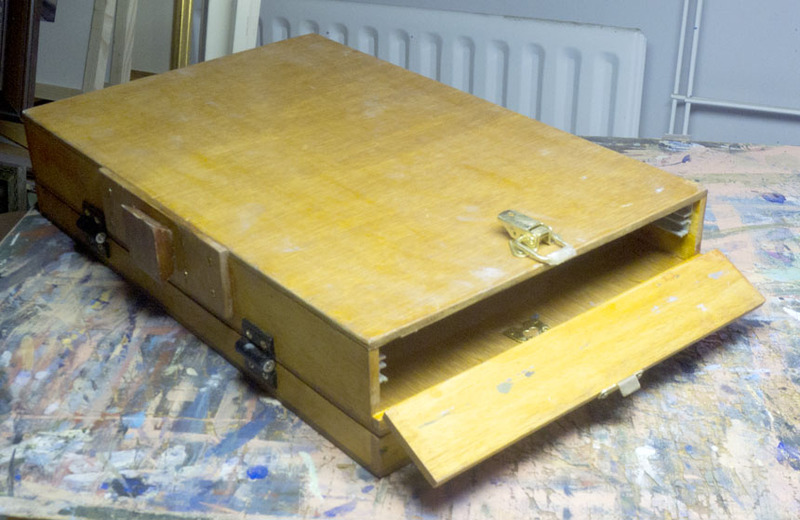 A studio picture done from a snap I took whilst trying to find where Constable painted from. We couldn’t get to the actual spot as signs threatened death or worse if we trespassed. The field was flooded a little but I had to relocate the water for optimum reflections. Another one from a snap. I have been eyeing up this view for a while and taken quite a few photos. 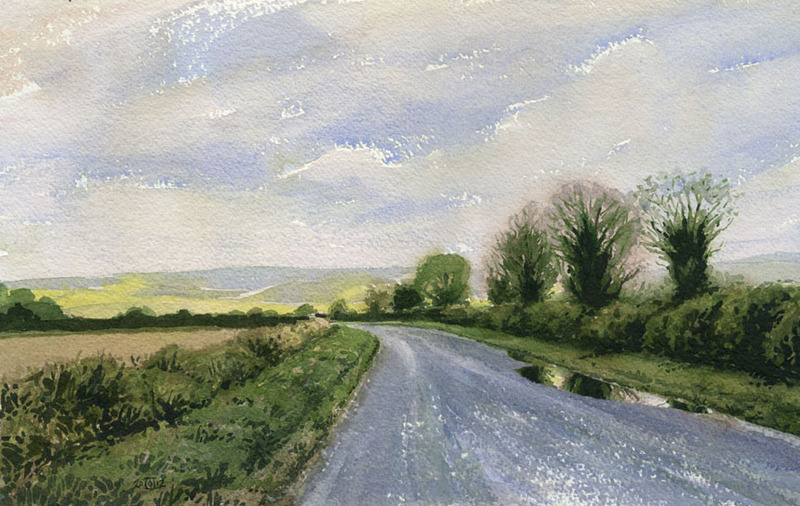 This one in the rain with the Blackmore Vale in the distance seemed to catch the mood perfectly. 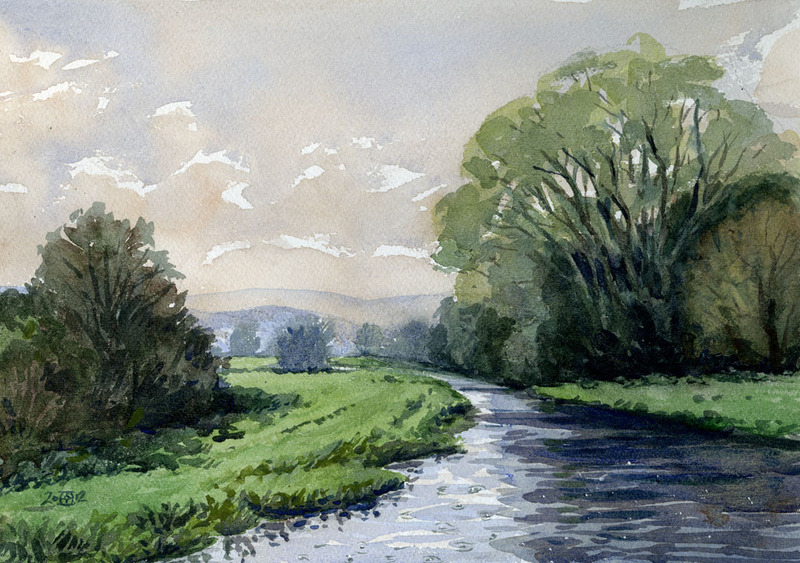 A very simple composition, but sky and land in opposing harmony give a lovely mood. 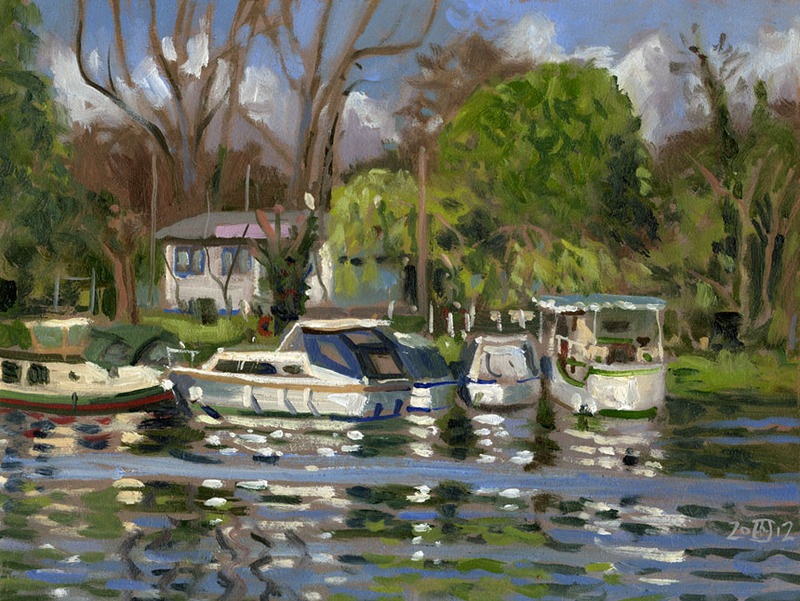 I had been very kindly asked by Steven Alexander of the Wapping Group to join him for a few days painting. The first oil is from this visit also and was done after this one. This is Castle St in Farnham. The light was very dramatic being very much contre jour which threw the buildings into sharp relief. One of those one where I was concentrating so hard I was quite taken aback to see it was done. 12in by 10in. Here we are by the Thames near Runnymede. I really wasn’t taken by the subject but worked hard to make something of it, I’m unsure of the result though others seem to like it. You also have to imagine the roar of the M25 directly above my head, which rather altered my perceptions. I am enjoying the wider 16in by 10 in format though. The end of the day I did this smaller sketch 10in by 8in. I’m never too taken with sitting on one side of the river painting the other bank, but here the water was quite interesting and the boats were glowing in the afternoon light. Still I didn’t want to spend too long on it so this is about 45min worth.